Cheapest this has been according to the three camels. 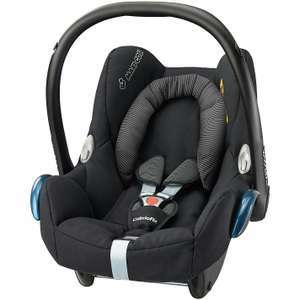 I can personally say that this is a great newborn seat and coupled with an isofix base makes putting your young ones into and out of the car a doddle. Especially when they're screaming, covered in snot and are overtired! Ordered baby on the way! Heat added good spot! If your car hasn't got Isofix, the EasyBase 2 is spot-on. We ended up buying a couple of bases second hand - they are extremely sturdy things. They fasten in with the belt and it is dead easy to get them utterly rock-solid. So we had a base in each car and, seeing as we had a Pebble and a Cabriofix and both fit onto the EasyBase 2, it was a doddle using the car seat, even if one seat had to be washed of various infant bodily fluids we could simply use the other. Anyway, heat for this - good price.